Pendimethalin is an herbicide used in many agriculture and non-agricultural environments to control broad-leaf and grassy weeds. It's used on corn, rice and other grain crops, as well as vegetable, cotton, nuts and tobacco, and residentially on lawns and ornamental plants. 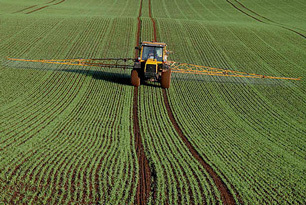 According to a 2007 report from the EPA, it is among the top ten most commonly used pesticides. Pendimethalin is persistent but immobile in the environment, and rarely found in water. Exposure can occur either occupationally or through trace amounts found in food. Pendimehtalin is mildly toxic with acute exposure, but animal studies have shown that long term exposure can cause liver damage as well as changes in kidney weight and blood sugar levels. It is not believed to be carcinogenic. The World Health Organization recommends granular activated carbon (GAC) for the treatment of pendimethalin.